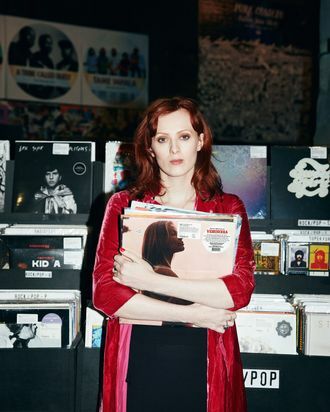 When Karen Elson first moved to Nashville, she got a call from a friend in the East Village, where she’d just vacated what she calls a “dodgy one-bedroom” on East 2nd Street: “All your records are out in the street.” Elson had mixed up the dates of her move-out — so her landlord summarily dumped her collection of thousands of records out on the sidewalk. A neighbor was able to save 15 LPs, but Elson has spent the time since then trying to rebuild her collection. During her first years in Nashville, Elson fell off her vinyl habit. “Obviously, being married to a person who has five record labels [ex-husband Jack White], records permeate everything in your life. I almost forgot about my own collection, in a way. Putting out another record has got me back into the idea of listening to vinyl.” Elson’s latest album, Double Roses, came out last month. She enlisted producer Jonathan Wilson, known for his work with Father John Misty, and pooled talent like singer Laura Marling and the Black Keys’ Patrick Carney, who plays drums on the album’s single “Call Your Name.” That song’s refrain — “I don’t call your name anymore / I can’t take the weight like I did before / Now you take my heart from out me / You’ll be the death of me” — has fueled speculation among some reviewers that the album is a breakup record about White. But Elson says the inspiration for the songs is more universal than that. “It’s the lonely nights when you’re sort of wondering, ‘What the hell am I doing? What am I about? What am I doing with my life? Where am I going?’” she says.